Joel Wool of Clean Water Action will bring you up to speed on key energy bills under consideration at the State House. Emily Norton, Sierra Club MA Chapter Director, will give you the tools you need to effectively advocate to your elected officials. 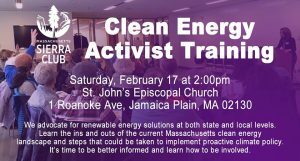 There will also be a short presentation from Andy Bean of Boston Climate Action Network on what is already being done to engage locally on energy and climate issues in Boston. Free and open to the public.